Five very different games, all with three players. Now that’s a good session. I began with Vladimír Suchý’s Shipyard, which looked to be a two-player game with Olly until Chris turned up just as I was about to embark (no ship-related pun intended) on the rules. Many of my favourite euros (particularly Stefan Feld games) are simply a vaguely connected bunch of mechanisms that slot together into a semi-coherent whole, and Shipyard fits into that category beautifully. With the industrial-revolution-era-shipbuilding theme tacked on, it’s so far up my street that it shares my postcode. Where Shipyard differs from many Feld games is that there’s only one main way to obtain victory points: building and sailing your ships. If you don’t like rondels, look away now. Shipyard is full of rondels. There’s a rondel on which players place their workers to choose an action (four of which direct the player to another rondel); there’s a rondel governing commodity prices; there’s a rondel for choosing which employee to take; there’s even a concentric pair of rondels. Yes, rondels within rondels. This is rondel madness. But it works, especially the very elegant worker-placement rondel which not only defines income and the choices of players as it progresses, but also acts as the game timer, with an n-player game lasting n laps of the rondel. The initial draw of government contracts left me feeling a little deflated; I had no killer combos and barely anything to aim towards. I settled into the groove for “5 VPs for each ship with all three safety features” and “3 VPs per propeller”, nabbing early in the game the employee that allows the fitting of an extra propeller. Chris, meanwhile, got his first ship built and sailed within the first half-lap of the action rondel. Olly took several employees quite early on (I think he had five by the end of the game), giving him some very handy bonuses when taking actions. A free businessman here, a free advance around a rondel there… I felt like I had some catching up to do. Chris seemed to be churning out ships at an alarming rate, sailing them with very little on board and often with quite low speed, but there was clearly some grand scheme at play. (He let slip that he was aiming towards the government contract offering points for ships of exactly five ship tiles.) My ships were all reasonably fast and loaded with propellers, but not much more. Olly, on the other hand, took a while to sail his first ship, but when he did it was a thing of beauty. A supertanker, seven tiles long, loaded to the gunwales with businessmen, cranes and as many other bits as he could fit on board. It was worth a pile of points, but it seemed unlikely he’d get more than two such beasts finished in the game; I, on the other hand, was going for medium length and strength in numbers. The thing with Shipyard is that the end of the game rolls around really quickly. Each player gets 25 actions for the whole game, and the last lap of the action rondel can take you by surprise. So it was for Olly and Chris, who ended up in the situation of having a final action that was pointless (Chris) or unaffordable (Olly). I make it sound like I’d planned everything perfectly, but no – although I could make full use of my final actions, I could tell they weren’t going to be enough to win the game. Olly’s behemoths had pushed him well ahead, while Chris’s steady churning of ships from his yard had been a solid points-winner. We revealed our secret government contracts to little surprise. Scoring them was a different matter. Olly was aiming for businessman–crane pairs (and scored lots thereof) and long ships (memory fails me here, but I think he sailed two, which gave the maximum bonus anyway), giving a bonus of 30 points; I had three ships with all three safety features, and five propellers across my fleet, for an identical bonus of 30; Chris, however, stunned us with his 16 points from used canal tiles. On top of his 22 from four length-five ships, his 38-point bonus sneaked the win by a single point. Yes, an uninspiring performance from me. I definitely felt hampered by my government contracts, but even if I’d chosen a different pair to go for I don’t think I would have kept up with the other two. Chris left and was replaced at the table by Jack, game designer, former game publisher and co-host of Newcastle Playtest. I’d brought Trains, which Olly recommended we play as a research tool for Jack’s deckbuilding work-in-progress Codename: Vacuum. Having not played Trains for over a year, I had to have a quick dive through the rules, but most of the concepts are so generic to all deckbuilders that it wasn’t long before we were up and running. I was attempting the Trains equivalent of Dominion‘s simple “big money” strategy: use money to buy bigger money, then eventually spend lots of money on victory points. As a result, once I’d built enough rails to make it unappealingly expensive to invade “my” territory, I started passing up chances to lay more rails and it felt like I was falling behind a bit on the board. Then – kapow – the big money kicked in and I was able to buy a few Control Room cards. With a simple power of “draw three cards”, these quickly turned into a bit of a killer combo. Several times, I played a Control Room to draw three cards, one of which was a Control Room which allowed me to draw three more. There was very often a Landfill and some Waste in amongst my now massive hand, so I could keep my deck relatively lean of Waste and buy the VP cards. I still wasn’t sure if I’d done enough on the board though, and the endgame went on a little longer than any of us expected, allowing everyone to get in on the VP-card-buying action. When the last station was built, marking the end of the game, I was well behind on the board scoring. Thankfully, my early switch to buying VP cards worked out in the end, giving me something like 26 points from cards alone and boosting me to a solid win (49 points, with Olly and Jack on 41 and 40… and no, I can’t remember which way round they were). All of us agreed that Trains is substantially more interesting than Dominion, and I’d like to play it a lot more often than annually. With thirty card types from which to select eight per game, there are (by my calculations) 5,852,925 different card combinations to explore. Not to mention two sides of the board. And that’s just the base game. So yeah – a few more plays until that one’s exhausted its possibilities. Next was Jack’s copy of Carcassonne: The City; this isn’t one of the many expansions, but a standalone cousin to the ubiquitous tile-laying euro gateway game. I like Carcassonne quite a bit, and it sees a fair bit of time on the table at home – it’s one of the few games that my kids can play and, crucially, want to play. (Note: we play without farmers with the kids. Give them a few years…) So I was very happy to try the City variation, if only to play spot-the-difference. It turned out to be a strange conceptual battle between the familiar, the novel and the needlessly confusing… but oh! How beautiful! SPOILER ALERT: this is at the end of the game. Yes, it’s a very pretty game on the table. I mean, I think normal Carc is pretty, but this is something else when you enter the second phase and start building the city walls. The first phase introduces the main bit of needless confusion: the brown and green colour scheme from Carcassonne is reversed. Green means markets, which hold a meeple until they’re completed; brown means residential areas, which retain their meeple in repose until the end-game scoring. This kept confusing me for at least two-thirds of the game. But with that comes the first novel mechanism: the only features that need to match at tile edges are roads. This has the benefit of making it much easier to complete markets (which can be achieved by simply butting them up squarely to a residential area), but that’s not necessarily something you want to do. Why? Well, the second phase introduces the walls, which are built in sections every time a feature within the city is scored. Finish a market? Everyone builds a bit of wall. Complete a road? Everyone builds a bit of wall. And with walls come guards, who watch over the city in a straight line and score points for buildings of historical interest in their view. While this is a very interesting (and yes, visually attractive) addition, it does mean the game suddenly bogs down heavily. And while each player only has two possibilities for placing their wall piece, there’s all sorts of looking along lines and counting up possible points totals in order to avoid gifting a huge guard bonus to the next player. When you reach the third phase and each completed feature heralds two rounds of wall-building… it starts to feel a bit mechanically stodgy. There are also little tweaks like roads scoring 1–2–3–8–10–12–…, meaning there’s a huge benefit to getting to four tiles on a road; also the fact that you can’t place a meeple to score a feature that will be completed by the tile you’re placing. Just a few extra things to bear in mind. Olly fell behind slightly in points towards the end of the game, but he completely overhauled me in the final scoring of residential stewards (that’s farmers for those of you playing along at home), while Jack powered away to win by about ten points over Olly. Looking back, I’ve used all sorts of negative words and phrases, but I did actually really enjoy the game. Yes, it’s fiddly and slow in places, and irritatingly familiar-yet-alien, but I’d absolutely play it again. There was a quick round of Love Letter before Jack left (we played to four points, Jack winning 4–3–3 by virtue of Olly playing the Baron on my Countess with his Princess… meaning I was out and it was obvious to Jack’s Guard exactly which card Olly was holding) and then Graham joined Olly and me for Quantum. 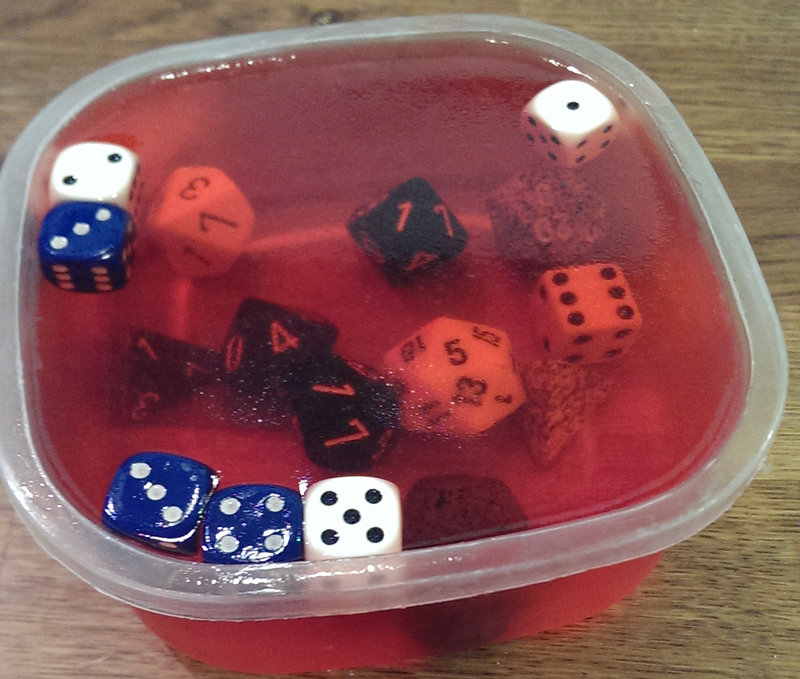 Olly had forewarned us about sticky, misshapen dice, but… wow. They really were manky things, like a fine layer of cheap strawberry jam had been permanently applied to each surface. Presumably this was part of the manufacturing process. Petrochemical/confectionery mishaps aside, there was a lot to like about Quantum. It’s pretty straightforward, plays quickly and has a lot of interaction/conflict/in-yer-face-stuff going on throughout. It was almost over before we properly got started when Graham found the beauty of the 3–5 combo (use the special power of the 3-die to swap places with the 5-die, then easily move the 5-die into orbit with the 3-die for an instant required total of 8) and placed most of his quantum cubes in the early rounds, but then Olly and I kept him in check with a constant barrage of brutal attacks. Graham probably felt a little ganged-up-on after he’d leapt ahead, but it just seems to be that sort of game. It’s a fairly tight little board for three players, giving it that “knife fight in a phone booth” feel. Because there was so much combat going on, my Dominance die (add one per combat victory) was slowly creeping up towards 6. With two cubes left to place, I managed to place both in one turn – one from battering a ship to death with my Battlestation thus pushing my Dominance up to 6, which grants an instant cube placement, and the last one from the 3–5 combo we’d seen Graham use in the early game. Instant win for me, even though I’d spent most of the game struggling to spot the right moves to make. If Quantum had been a longer game, I don’t think I’d be that keen on it. But as an end-of-the-night, swingy, conflict-heavy, 45–60-minute space game, I think it hits the spot. Once Olly’s got some non-sticky replacement dice out of the publisher, it’ll be great. All photos by Olly and me, shamelessly stolen from the Newcastle Gamers Google+ page. Newcastle Gamers is on the second and last Saturday of every month, 4:30 pm until midnight at Christ Church, Shieldfield, Newcastle upon Tyne! This entry was posted in Session Reports and tagged carcassonne the city, love letter, manky dice, quantum, RONDELMANIA, shipyard, trains on 13 October 2014 by Owain.